Heat oven to 300°F. Line 8-inch pan with heavy-duty foil so foil extends over sides of pan. In small bowl, mix wafer crumbs and butter. Press in bottom of foil-lined pan. In large bowl, beat cream cheese and sugar with electric mixer on medium speed until smooth. Beat in sour cream, vanilla and eggs. Pour over crust. Bake 30 to 40 minutes or until edges are set (center will be soft but will set when cool). Cool in pan on cooling rack 30 minutes. Cover; freeze 2 hours. Meanwhile, cover 1 large cookie sheet with waxed paper. Remove cheesecake from pan by lifting foil. Cut lengthwise into four long pieces. Cut each piece into 7 triangles, working with 1 long piece at a time (keep corner pieces for snacking). Insert sticks into bottoms of triangles. Place on waxed paper-lined cookie sheet. Freeze 30 minutes. If making ahead, cover and freeze until ready to coat with chocolate. Meanwhile, in 2-quart saucepan, melt chocolate chips and shortening over medium-low heat, stirring frequently, until smooth. Place in medium bowl. Working in 2 batches of 14 (keep remaining in freezer until ready to coat), dip each tree quickly into melted chocolate to coat, letting excess drip off. 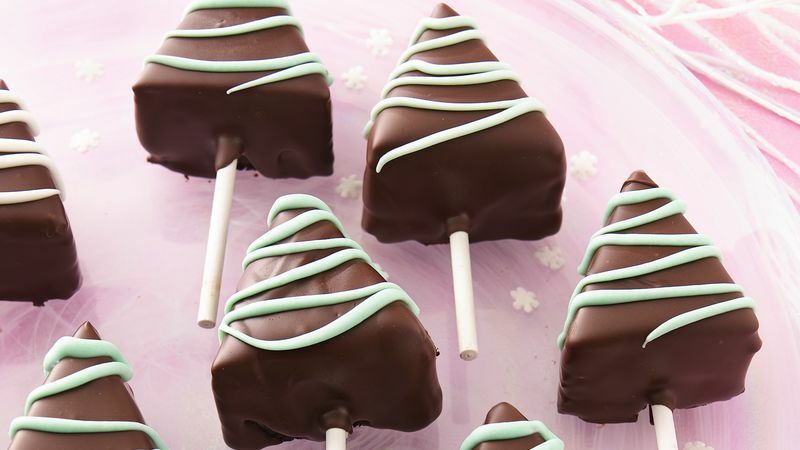 Use knife or spatula to spread chocolate around stick entrance. Place crust side down on waxed paper. In small microwavable bowl, microwave candy coating and oil uncovered on High 1 minute, stirring every 15 seconds, until melted. Stir in food color. Spoon into 1-quart resealable food-storage plastic bag. Seal bag; cut tiny hole in corner of bag. Pipe melted coating over trees to look like garland. Store covered in freezer.